Hi everyone. I’m looking to join a team for the Road America race in April again. Racing resume available upon request. I’m looking for a seat for Road America next year. No power in the pits. Hey guys. We have one seat open for this race in our EC BMW 325is/M3, The Green Dragon. We are really looking forward to letting the M3 power and brakes loose at Daytona. Myself and Johnny "Lightning" Robinson will be piloting. 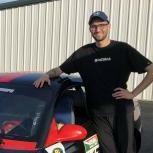 We also have Cagri "Charlie" Yilamaz joining us who is a fellow ChampCar driver from our sister team, Enger Racing. But we want one more quality driver to complete the ensemble. Here's our Facebook page. https://www.facebook.com/GreenDragonRacing/ PM me if interested. We'd love to have you. It'll be a riot! It's manned during the whole race and yes, they will display black flags from the flag stand. They usually have some supplies like numbers and panels but it's best not to count on it and purchase them from the RVA graphics website in advance if you have time. This is what I got back from RVA. They are 14" 3/4 x 25". What are the dimensions of the number panel? Looks like both Verizon and AT&T score a 7 out of 10 in signal quality at Road Atlanta. There's music in the podcast version for your pleasure. Is There a Limit to EC Class?